Victoria Falls is twice as high as Niagara Falls on the USA/Canada border and twice as wide as Horseshoe Falls. Despite this, Victoria Falls is not the tallest waterfall in the world, nor is it the widest. But it is generally considered the largest because of the single mass of water from the Zambezi River which plunges over the rock ledge into the six narrow, zig-zag gorges below. Only Iguazu Falls in South America can rival Victoria Falls’ power and beauty. Our trip to Zambia and Victoria Falls came just after a long period of intense rains, which was unusual for this time of year. 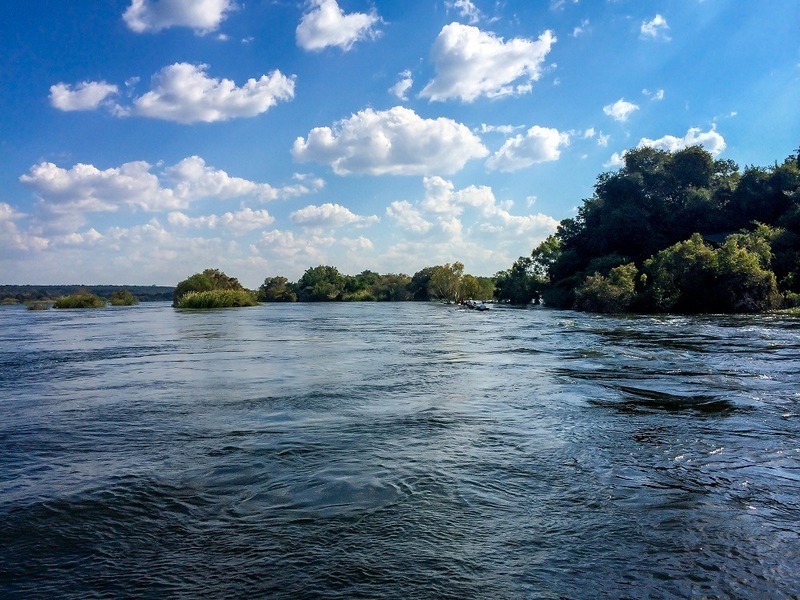 Despite being late in the shoulder season and heading into the dry season, the Zambezi River was bloated with excess water. Locals in an upstream village told us this was the highest the river had been in 12 years – and nobody could remember this much water so that late in the season. The result could be seen at the falls and the spray visible in the sky over 25 miles away! 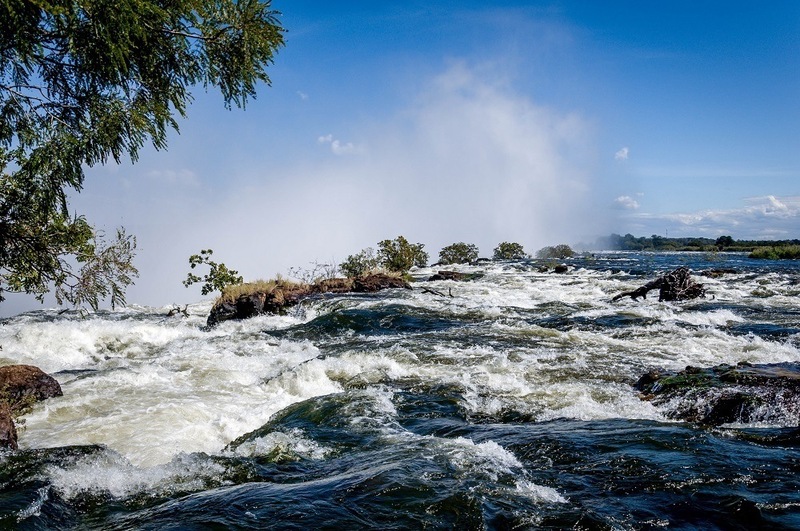 The Zambezi River and the falls form a natural border between Zambia and Zimbabwe (formerly North and South Rhodesia). 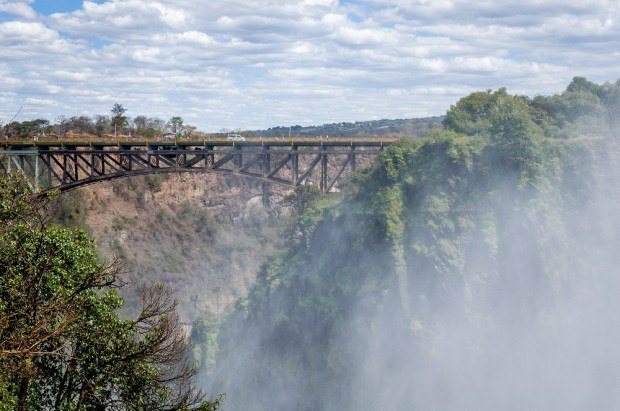 Since tourism started in 1905, most tourists have visited the Zimbabwe side of the falls due to better infrastructure. But, like most visitors these days, we chose to visit the Victoria Falls Livingstone, Zambia side because our visit coincided with a period of renewed tensions on the Zimbabwe side of the falls. Since 2001, the majority of visitors now come to Zambia instead. 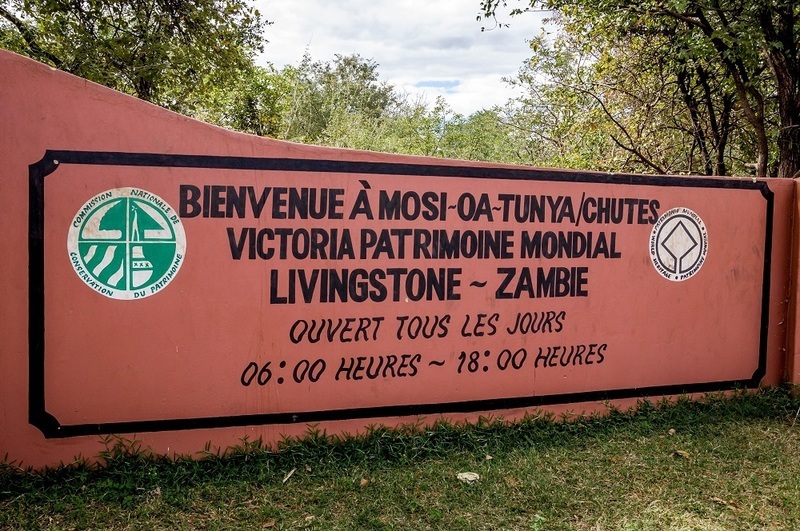 This evolution has made Livingstone a significant regional hub for travel and tourism. 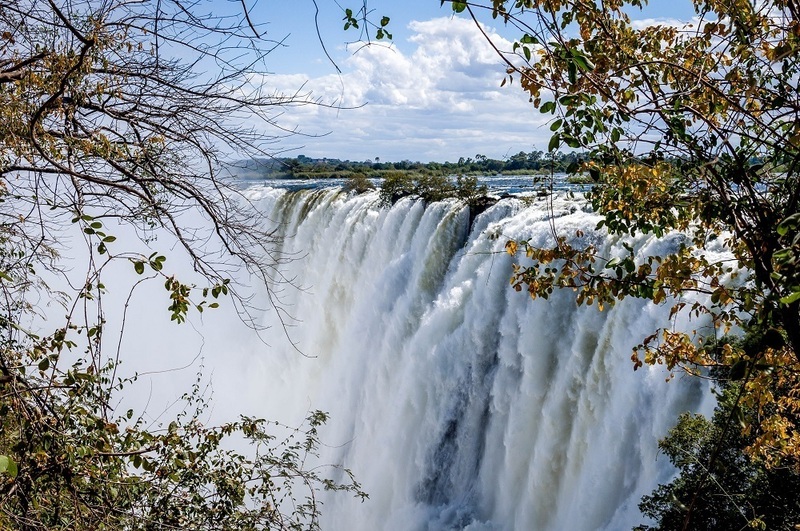 Visiting the Victoria Falls Livingstone side during peak flow is like getting into the shower with all your clothes on – and then stepping on top of a water sprinkler. We were warned – if you go to Victoria Falls you might get wet. 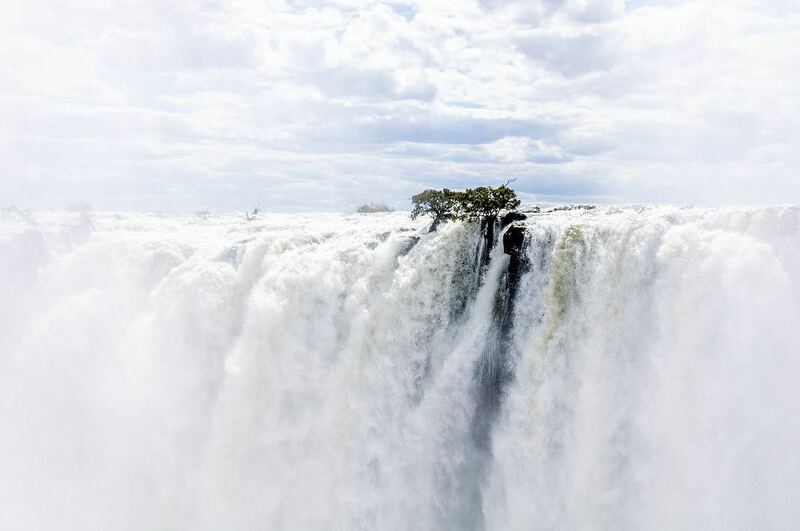 What they should have said is – if you go to Victoria Falls you’re guaranteed to get absolutely soaked. We had brought ponchos for this purpose, which were generally ineffective (a waterproof jacket and pants would be a better choice). The water flows from all angles, including up! 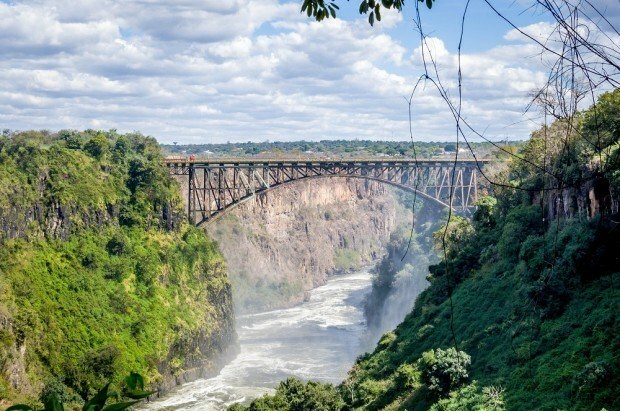 As the Zambezi River plunges over the walls and into the deep gorge below, some of the water is propelled back up the far side of the gorge (where you are walking) and becomes rain falling up into the sky! I’ve never seen anything like it before. Because of the extreme mist/vertical rain from the falls, it was difficult to see much of Victoria Falls. The deep gorges were almost completely obscured by the white, smoky mist (we had brief moments when the wind would carry the mist in the opposite direction to take a few photos). As the water vapor rose into the sky, it would even obscure the sun for periods of time. We found ourselves using our imagination to recreate what it must have been like for Dr. David Livingstone visiting the falls in 1855. 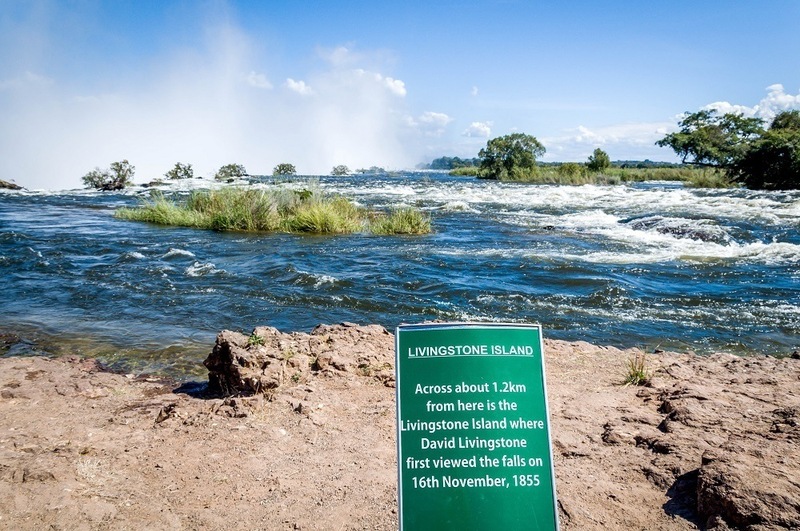 Due to the high waters during our visit, it was impossible to reach Livingstone Island. To fully appreciate Victoria Falls from the Zambia side, you have to cross the Knife-Edge Bridge. The bridge connects the main shore with a rocky ridge forming the first and second gorges of the zig-zag canyon below. Now, this might be a good time for me to mention that I’m scared of heights. Thankfully, I was able to make it across the bridge with very little difficulty (mostly because there is so much mist you can’t really see anything). When Livingstone came to Victoria Falls, he approached them from up river and the numerous islands that dot this section of the Zambezi. Just as he fell in love with the beautiful islands that were dense with foliage, we were also smitten. We were fortunate enough to stay on the two Islands of Siankaba. This was a good base to explore the region and just sit on the bank and watch the mighty Zambezi River roll by. Victoria Falls is one of the planet’s great natural wonders. We feel fortunate we were able to visit on this trip to Africa. Visiting tip: Victoria Falls is frequently included on African tour itineraries, such as Rock My Adventure Tours. What do you think about Victoria Falls is Gorges (and Wet)!? Love that you got to go here! One of my favourite places in the world! The spray in May is insane. But good on you for facing your fear of heights! According to locals, the Zambezi water level was the highest in years, which only added to the spray. We got completely soaked, but it was worth it! Nice post Lance. I lived in Zambia as a kid and have been back a couple of times. Victoria Falls still one of the most incredible places I’ve been – and while Iguazu is impressive, Victoria is about 100ft higher and, in my opinion, just more spectacular. Still want to make it back one day for another look. Funny how things change. When I was a kid we were in Zambia because there was a civil war in what was then Southern Rhodesia. That later became Zimbabwe and was for a long time the shining light of Africa. Harare was a very nice city when I visited in 1989. Now Zambia seems to be the safer of the two countries…funny how quick things change in Africa. Wow Frank! That sounds absolutely fascinating. I lived in Nepal during the civil war there and it was quite the tumultuous time. Your experience sounds very interesting. Have you written about it? I’d love to read more. There’s even an old photo of Victoria Falls there, I wonder if that small bridge still exists…as I say, I’d love to go back one day and show Spanky a bit of Africa. We visited Iguazu Falls earlier this year and it was just an incredible experience. I would love to see Victoria Falls to add it to my list of amazing natural waterfalls! Emily took the words from my mouth. Iguazu was incredible. On an entirely different level to Niagara Falls which is near where I lived many years ago. While Niagara is graceful and beautiful, Iguazu is an awe-inspiring monster. I expect Victoria Falls to rival it. It is definitely on my list. the picture at peak flow is just UNREAL. so stunning, we hope we can make it there someday soon! Waterfalls are always fantastic, lovin’ that bridge shot! What a rush! Haha, sounds like you guys got properly soaked :-p We just finished a trip to Iguazu Falls in Brazil which was absolutely mind blowing! Great read and wonderful pics! It seems to be a great place to experience at least once in a lifetime. It absolutely is. We’d love to go back at low flow and try the Devil’s pool — you can go right up to the edge of the falls. Has anyone ever fallen off from Devil’s Pool? Your question sent me to Google. Looks like people have fallen from various places along the edge. Wikipedia says “occasional deaths have been reported.” Eek. Dying to get to Zambia! So cool you got to see all of this. Waterfalls are one of those things I’ll never get tired of, no matter how many I see in my lifetime. This one is now on the “waterfall bucket list,” sounds like an incredible experience! Amazing photos! Definitely on my list! Wow, how magnificent!! Would love to go there! Looks like a special place. I’m not normally big on waterfalls, but Victoria Falls takes it to a whole different level. Thanks for sharing, this is high on our list for a trip to Africa this fall (Zambia and Tanzania are battling it out in our heads, with Zambia taking a slight lead 🙂 ). Reading this makes me even more excited to go, thanks! I’m sure both choices would be wonderful, but we really enjoyed our time in Zambia. Have a great trip! This was such a joy to read; it looks like you had a lot of fun at Victoria Falls! 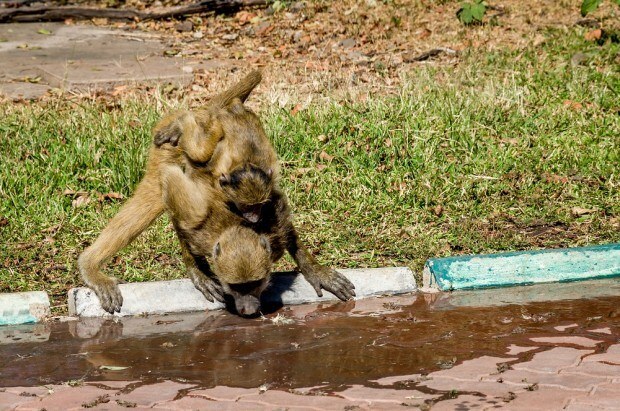 I especially loved your photo of the Zambezi River on top of the falls, and the baboons look adorable! I’ve only made one trip to Africa so far, but I’m definitely going back. Victoria Falls is definitely on my Bucket List!